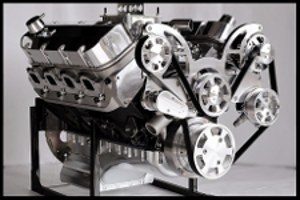 Designed for competition 396-502 big-block Chevys. #2904 fits oval-port heads. These intakes are designed to optimize the flow characteristics of an 850 cfm standard flange carb. Features include extended runner dividers, smaller plenum chambers and unique runner design for better 60 foot times and max power from 3500 to 7500 rpm. These manifolds are especially suited to 502 c.i.d. and smaller competition engines. 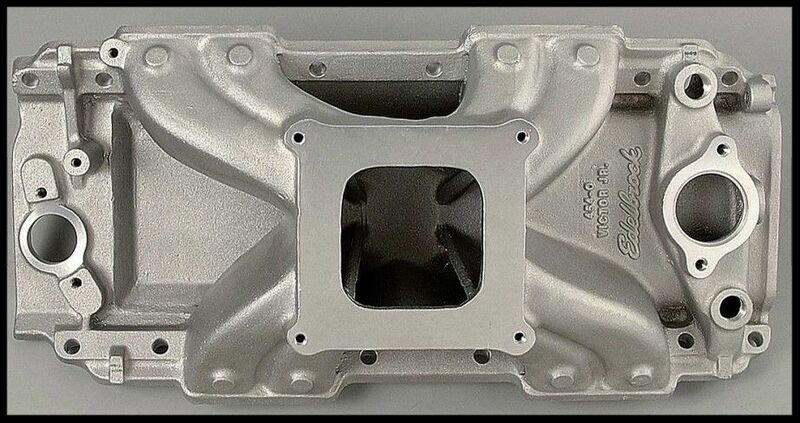 Manifold Height: (A) 5.90", (B) 5.90"
The Edelbrock Victor Series intake manifolds for big block Chevy engines are designed for high rpm performance right out of the box. Constructed from cast aluminum for reduced weight and better heat dissipation, the raised air-gap style single-plane carburetor mounting pad, straight runner design and unique runner dividers offer increased power and better 60-foot times. With a wide variety of products developed by top engine builders available in single 4-bbl Victor Jr and Victor series, the possibilities of creating maximum power from your application are endless. When you design and sell the best-engineered performance products in the world, you have to have a rigorous testing program. Why? Without adequate testing, there's no way to stand behind your product with confidence. That's why every product we design and sell at Edelbrock is tested and approved by Edelbrock engineers in a real world environment on state-of-the-art equipment. Our three Super Flow computerized engine dynos are capable of measuring 11 separate engine variables up to speeds of 12,000 rpm. For 2007, we added a new Super Flow SF902 engine dyno. It's fully automated and programmable to simulate various driving situations, and is equipped with WinDyn software for the very latest in testing equipment. For real-world tuning, there's our Super Flow model SF-840 eddy-current chassis dyno that can handle up to 1,000 hp at the wheels and speeds of 200 mph. When all testing is completed, the results evaluated, and the part has passed all performance criteria, then, and only then, is the product deemed ready for production. These precise testing procedures are applied to the entire Edelbrock line for performance that's guaranteed. Edelbrock test vehicles are driven by Edelbrock engineers and employees to get a "real world" feeling for the performance improvements. Our products are also tested and used by professional race car teams and drivers. Working with these talented individuals is just another extension of our research and development process so when we say "proven performance," we really mean it! Top racing teams in all forms of motorsports rely on Edelbrock to produce parts that they can count on to win races and championships. Further underscoring our commitment to the racing community, Edelbrock is the only aftermarket intake manifold manufacturer licensed by NASCAR. We offer a full line of the Speedmaster and Edelbrock intake manifolds. It is our opinion that the Edelbrock line of intakes is a much higher quality intake as compared to the Speedmaster or other similar intakes. The overall fit and finish as well as performance are much better. We have dynoed thousands of engines using both brands, and can clearly see the difference in the final dyno results. Be sure of what style manifold you need before purchasing. For installation tips, we suggest that you check the technical section of the various car forums. YouTube is also a great source for detailed installation instructions.